You have always thought about it, wanted it and now you have finally done it. You have made a home bar. You’ve purchased some essential accessories: glassware, stemware, the ever-important bar stools. You even have your coasters and are ready to go. Yet, you are still in need of the basic tools to mix your drinks. Not exactly sure what to get? This is where we come in. You really don’t need too many barware accessories to have a great bar at home. As long as you have the basics, you are good to go. So, what is a shaker? If you have seen any movie with a bar and a bartender, you have seen a shaker in action. Any bar staff who mix drinks will use this tool to blend the ingredients of the alcohol together, chill, aerate and, when needed – dilute the drink. Shake - shake - shake - and voila, your drink is ready to go. Boston shaker - this is usually two metal cups that fit one within the other. This type of shaker typically requires a strainer to filter out any chunks of ice or other debris if you are using natural fruits. You will see most professional mixologists using this shaker. Cobbler shaker is a set of three pieces. It has a cup that tapers at the bottom, a lid that contains a built-in strainer, and has a cap. For the novice mixologist this may be an easier one to use. French shaker is another two-piece set. It has a metal cup and a metal cap. A separate strainer is required for this one. Now you will need to consider a ​jigger. A jigger is a bartender’s friend when measuring out the alcohol required for each drink. Once measured, the bartender will pour it into a shaker and proceed to the next liquor to be added. Jiggers look a lot like metal hourglasses. They range in size and volume, how much each one measures is based on the region you are in. 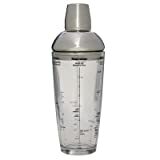 In the US, a typical jigger will measure out 44 ml of liquor, while in the UK they can range from 25 to 35 ml. Today, some jiggers even resemble mini measuring cups. The ​strainer is also an essential tool for your needs. It is used by mixologists to strain or prevent the ice in the shaker from being poured into the glass. There are different styles of strainers; some that are a metal disc with a spring around the outer edge – the Hawthorne; or what looks like a large, deep, metal spoon with holes in it – the Julep. 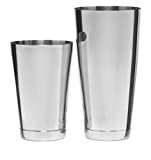 Either one will help you strain the liquor as you pour the mixed drink into the glasses. A ​muddler is a simple bartender’s tool. It is used like a pestle in a mortar and pestle set. It is used to smash (muddle) fruits, spices and herbs in the bottom of a glass to help them release their flavors for the drink. The bar mixing spoon is really just a teaspoon with an exceptionally long handle that is twisted. The length of the spoon is essential when mixing a drink in a very tall glass, jug or decanter. It will reach all the way to the bottom, ensuring that you get a good mix throughout the glass. The twisted handle makes it easier to spin and stir the drinks in the glass. 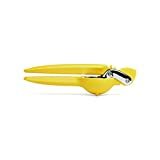 A citrus press is nothing more than a citrus or lemon squeezer. Use the device to extract the juices from citrus fruits when the drink requires fresh fruit juice. These days they are found in all shapes and sizes. You can still buy traditional glass ones, like the one your grandmother used in her kitchen. There are also fancier versions that work like an actual press. Each one is great for what you want it to do. Mixing glasses are used for drinks that should typically be stirred and not shaken. This is normally done for drinks that contain clear spirits and liqueurs. Drinks like martinis or Manhattans, Sazerac, and the “Old Fashioned” are suited for these glasses. A great mixing glass will have straight sides, a heavy base and ideally, a pouring spout. Yes, you can use a pint glass, or even a large measuring cup, but a true mixing glass is so much nicer, more durable and much more elegant. 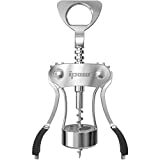 Corkscrew, oh the ever important corkscrew – a simple device that removes the cork from a wine bottle. How many times have you been unable to open a bottle of wine because you didn’t have a corkscrew? Too often, for sure. So, it is recommended that you have a corkscrew (or two) in your home bar. You will be lost without one. There are many types of corkscrew a wine connoisseur can use to open a bottle of wine. There are two corkscrew styles that we see most commonly. They are the sommelier knife – better known as the waiter’s knife – and the winged corkscrew. The sommelier’s knife looks more like a fancy Swiss army knife and the other is a twisted screw device with wings at the sides. Both are a good design, you just have to pick the one you are most comfortable with. Wine cork – wine preserver. This is a must if you are a wine drinker. More so, if you are at home alone and may not finish a bottle by yourself. Or, maybe you are entertaining and want to protect your precious bottles of wine from dust and possibly insects. You will definitely need a wine cork. Aerators. Why do you need an aerator? Any fine wine enthusiast knows that, prior to serving and pouring your wine, it should “breathe”. An aerator eliminates the need to let the wine sit, or the need for your guests to swirl the wine in a glass. An aerator mixes air into the wine as you pour it. This makes the wine ready to drink immediately. We took some time and did some research for you. Read below to find out what we feel are the best barware accessories on the market. For the novice, we recommend the Tablecraft H2400 Boston shaker. It is a clear 24-ounce shaker that helps you measure your alcohol with more precision. The sides of the shaker have printed drink recipes to help you make your very first mixed drinks. It has a stainless steel cap with a strainer. This will take the guesswork out of your brand new hobby. Koriko Tins are designed for a good fit with easier separation after shaking. For the more experienced mixologist, we have selected the Koriko weighted, shaking, Tin. This set has perfectly weighted tins. The seal on them is easily broken so you are not struggling when it is time to pour the drink, and the hawthorne-style strainer fits perfectly with this. 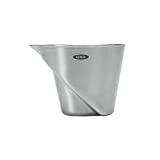 Our best pick for a jigger is the OXO Steel Angled Jigger. The angle design allows you to view it from above, so you don’t have to raise it to eye level to check how much liquor is in it. The measurements are in ounces as well as tablespoons, so you can follow any recipe. It also has a great pouring spout to reduce any spills or drips. 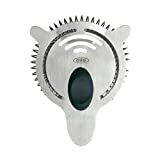 The OXO Steel Cocktail Strainer is our top pick. The stainless steel strainer has a soft non-slip finger rest on top, making it easy to grip without any slippage. It will strain fruit, seeds, ice and more. The raised lip prevents any drips or spills and the shorter handle makes it very convenient for storage. Our top choice is the Fletchers’ Mill 11 inch Wood Muddler. The unfinished maple muddler will crush ice, fruit, herbs and spices. It is designed to be able to use either end. Fletchers’ mill sells the muddlers in two different sizes: 11 inches and 7 inches. This is a great addition to any home bar setup. 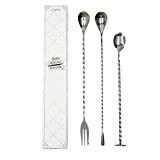 One of the best spoon sets for your bar is the Trendy Bartender Bar Spoon Set (set of three) which is a great trio of versatile mixing spoons. These spoons are well-balanced and have a twisted handle to make stirring easy. You cannot go wrong with this set; it has value and functionality. Our selection for the best citrus press is the Chef’n FreshForce Citrus Juicer. The innovative gear mechanism at the hinge helps yield 20% more juice than most other juicers on the market. Not only that, the gear mechanism is easy on your hands. While this may not be an essential part of your bar repertoire, it does come in handy. HAND CRAFTED - Handblown, hammered, and cut by skilled craftsmen. SEAMLESS DESIGN - Free of seamed lines that accompany machine made glassware. DISHWASHER SAFE - Made with high quality, ultra-clear glass that is conveniently cleaned in the dishwasher. The best choice for the bar mixing glass is the Umami Mart Seamless Plain Mixing Glass. While simple and plain, the seamless hand-blown mixing glass is heavy duty and durable. It will stand up to the abuses of stirring. The smaller pouring spout is ideal for preventing drips and spills. The mixing glass is also dishwasher safe. Our Sommelier knife choice is the Zerlite Waiter’s Corkscrew. This waiter’s corkscrew can do it all, just as if it was a Swiss army knife. It is a corkscrew, foil cutter and bottle cap opener combined. The double-hinged fulcrum makes it easy to attach to any bottle. The rubber handle gives it a comfortable feel in your hand. It also comes with a lifetime money-back guarantee. Our winged corkscrew choice is the Rabbit Chrome Wing Corkscrew. The base of the corkscrew clamps onto the bottle, making it easy to insert the spiral into the cork. The spiral will penetrate the cork cleanly so that the cork does not crumble. No one wants crumbled cork in their wine. It is an elegant piece for any table or home bar. The Vacu Vin Wine Saver is a vacuum pump that extracts air from an opened bottle of wine. It then re-seals the bottle with a reusable rubber stopper. The vacuum seal preserves your wine after you have opened the bottle. Now you do not have rush through drinking a bottle, you can savor the wine until the very last drop. The smart design makes it a fantastic addition to any home bar. Vacu Vin also offers a five-year limited warranty against manufacturing defects. Our best pick for the aerator is the Vintorio Wine Aerator Pourer. 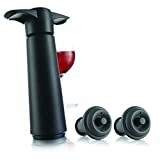 The Vintorio aerator and pourer has a large aerating chamber and intake system and utilizes Bernoulli’s principle to infuse your wine with the perfect amount of oxygen. One of the best ways to tell if your wine has the optimal amount of air is via bubbles. The Vintorio Aerator allows you to see this effect for yourself with its clear pouring spout. You will get the satisfaction of knowing that you can drink your wine immediately because it has been properly aerated as you poured it. There is now a diverse market for the home bar. Knowing exactly what best barware you need is the first step on the way to achieving the ideal home bar. We did the research so that you don’t have to. Now that the research is finished, we have compiled this information together in one place and broke down each category so that you know what you are looking for. Then we told you what we felt were the best options for you. There are tools and accessories in this list for the novice and also for the more experienced home mixologist too. The items we selected for you will be fairly easy to find and are reasonably priced. So now you know which direction to head in, it’s time to go shopping for the best barware.